A current transformer (CT) is a transformer used to measure alternating current. CT is a part of instrument transformer. 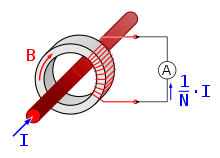 CT is used to measure current in a circuit when the current magnitude is too high to be measured safely. It is commonly used in power metering and power system protection. This page was last changed on 8 October 2016, at 06:57.